Rub the pork roast with the olive oil, then season well with the salt and pepper on all sides. Heat a large skillet over medium-high heat and sear the pork roast on all sides, about 3 minutes per side, until browned. This step is optional. Transfer the seared pork roast to the slow cooker, then combine all the onion, garlic, canned tomatoes, ginger, fish sauce, chili garlic sauce, spicy brown mustard, and brown sugar in a medium bowl. Stir well, then pour over the seared pork roast. Cook on low heat for 6-8 hours, until the meat shreds easily with a fork. 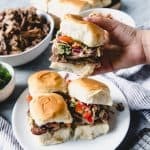 Serve on sandwich or slider buns, sliced in half horizontally, topped with Asian coleslaw and cilantro. You can skim the fat off the sauce then return the pulled pork to the sauce if you want it extra juicy. The nutrition is only for the pulled pork and does not include the buns or coleslaw. If you don't have fish sauce, you could substitute soy sauce instead. It's not quite the same, but still good. Adapted from White on Rice Couple.